Our janitorial software improves efficiency and helps your company remain competitive in today’s challenging custodial services market. With automated bidding, advanced asset and employee tracking, plus scheduling and appointment emails, it saves you time and lets you focus on more important areas of your business. We understand it is not easy to stay on top of today’s fast changing technology. However, every business needs to have the right technology just to compete in today’s market place. That is why Thoughtful Systems has been perfecting Scheduling Manager software, developing applications specifically for janitorial services companies, for over 25 years. During this time, we have continuously improved and expanded our software using valuable insights from our janitorial and custodial business clients. This allows us to deliver the best possible software solution to meet their individual needs. The janitorial services industry is an enormously profitable market projected to grow to over $60 billion by 2020. The primary customers are commercial, industrial and government organizations. They contract with outside janitor services to clean and maintain their facilities. As economic conditions continue to improve, this industry is experiencing increases in demand and rising profits from corporate clients in all industries. Moreover, educational and medical institutions particularly offer great profit and growth opportunities for janitor services. These companies continue to outsource office and industrial building janitor services to external businesses. For most janitorial companies, capitalizing on this trend is no simple task. There are many companies just like yours competing for these jobs. As a business owner, you must first position your company as a leader in the industry, and market your services correctly. Janitorial software helps you do this by automating tasks like scheduling, estimating and bidding, accounts receivable, asset and employee tracking. While a janitor service company can be an extremely profitable business, the market is highly competitive. There is intense price competition while owners see an increase in employee compensation costs. This can strain profit margins, leaving little room in the budget for quality office staff and marketing campaigns. But every company needs to focus on customer retention strategies, like providing great customer service and great marketing campaigns. Scheduling Manager software for janitorial businesses provides fully integrated and automated business tools for marketing, customer service, scheduling and appointments, accounting, and employee management. Developed using our years of experience and insights from our own clients, it is a tested solution that can make your janitorial business succeed. Join us on a journey towards success and benefit from advanced computer technology that makes your business more competitive and profitable! There are powerful marketing features integrated into our Scheduling Manager software designed just for the janitorial business. The Integrated Email Module creates and sends successful email-marketing campaigns, automates bulk emails to regularly advertise services, promotions and special offers. It also responds to service inquiries faster than the competition with our Online Inquiry Form. This helps you retain existing customers and expand your business professionally. Efficient employee management is greatly important to the success of any janitorial service and can greatly reduce the operational costs, increasing your profit margin. With Scheduling Manager software, you can group employees into teams and change the teams on a daily basis or for individual jobs, make team management and scheduling tasks much easier. Scheduling Manager makes managing your janitorial company payroll a breeze. Payroll information is automatically recorded when the job is complete and all you need to do at the end of your pay period is run your payroll report! Scheduling Manager handles six rates of hourly pay, overtime pay, pay-per-job, and commission pay. And it also handles bonus pay, deductions, tips, fixed pay, and combinations of all these pay types! You can automatically import timekeeping data from our SM-Mobile App, as well as export Payroll data to any specialized payroll programs, including ADP, Paychex, QuickBooks and more. 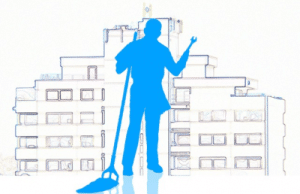 There are many benefits to using our janitorial software for you company. First of all, you can enter information once only. No need to re-enter your client information into multiple software programs, wasting time and potentially causing errors that can make your business look unprofessional. With our software, when you complete a job, the invoice is created automatically. Time spent by each janitor on the job is recorded. The payroll is calculated, and the amount paid by the customer is also recorded. This saves you a tremendous amount of time. When you increase efficiency in your organization you can focus on other more important areas like marketing, lead generation and follow-up, and customer service. Our integrated e-mail marketing tools can help you market your services faster and more effectively to new and existing clients. Your business can bring in new revenue streams to become more profitable. Specially designed for janitorial businesses, our software is used by thousands of happy clients in more than 15 countries. Gives us a try and see how you can turn your company into a more profitable and professional operation.